For many cinephiles, cineastes, filmmakers and Frenchmen Nicholas Ray was a titan—a man who thrived with a remarkably independent vision in the grind of the studio era. Almost exactly a year ago Criterion released Ray’s classic (and my favorite of his films) Bigger Than Life on DVD. Here, in a review, Rob Ribera commented, “the film remains a delirious fever dream of longing, entrapment, angst and addiction.” Such words seem to characterize the life Patrick McGilligan aptly details throughout his biography, Nicholas Ray: The Glorious Failure of an American Director. But where Ray’s film is layered with hallucinatory yet precise beauty, and his life is littered with bizarre relationships and confused characters, McGilligan’s prose is geared towards tracing a certain clear narrative with simple language. The research is deep and the author’s focus on Ray’s life before his rise to fame and after the success of his opus Rebel Without a Cause (1955) provides a new lens on his career. Ray’s life is not the story of unused potential. His story is not a Greek tragedy. He is no Oedipus. This is a tale of a definitely modern life filled with all of the contradictions, complexities and challenges that come with having a desire to be both political and popular and all the while remain artistic. It was the challenge of one who as McGilligan describes was “an eternal delinquent” constantly seeking a home and a community, all the while desiring to stand alone (276). Ray’s rise was long and arduous and his downfall, which was never so much a downfall as an inability to push forward a stunted career, owed as much to his addictions as it did a lifetime of bizarre relationships with important people. Like a man who could never swim but could stay afloat, Ray seemed to tread along throughout his life trying very hard, and yet not giving quite the effort needed. Ray presents one of the most interesting filmmakers in highlighting film studies’ fluctuating relationship to auteurism. Put forth by the critics such as Francois Truffaut in France and pushed further by Andrew Sarris in America, “la politique des Auteurs” suggested even in the factory that was the studio system, even amidst the collaboration of set designers, assistant directors, actors and coffee runners, an individual vision created by the director could emerge—if they were talented enough. As comprehensive and fascinating monographs continue to be written on specific directors by creative authors, film studies continue to cry out against itself “that’s auteurist!” From Godard’s now oft-cited claim in his review of Bitter Victory that “Nicholas Ray is the cinema” any view of Ray carries with it the entire baggage of auteurism and the consequent rift between academics (who seem to shudder at the term) and film critics. There is something sincere in critics embracing auteurism, even if in many instances the director only provides limited insight into a film’s unfolding. McGilligan’s own struggle represents film studies ever-precarious understanding of itself where there is a desire to both hold on and grow from auteurism and yet also to break and shatter what seems like a relic from a past era of criticism that was fervent and purposefully polemical. This ongoing struggle is reproduced in McGilligan’s rendering of Ray. McGilligan is often pulled between the poles of the production facts and an auteurist love for Ray, the great auteurist director. Broad claims are made: “A Nicholas Ray film always worked best when he could explore himself in the main characters” (136). Only later does the author ask, citing details about the importance, or lack thereof, of Ray in what is supposedly “A Nicholas Ray film.” There are other gaping statements that prove themselves untrue as well; McGilligan claims that once the conservative climate of 1950s burrowed its way into Hollywood ‘the era of socially conscious picture-making had come to an end” (230). Yet, he then goes on to talk about Rebel Without a Cause and Blackboard Jungle, two socially conscious films that typify the wanton worries of the 1950s. The strength of Nicholas Ray: The Glorious Failure of an American Director is McGilligan’s exhaustive research. From interviews and correspondences, to letters and press releases, the author weaves various sources together creating a quilt of information. It is in these citations where Ray’s voice emerges, and consequently where the book is at its most profound. However, when McGilligan loses sight of the narrative and digressions take over moments, Ray’s life seems to reveal moments of humanity and sincerity. McGilligan’s account of Ray’s love affair with a shadowy woman known only be her first name, Manon, or his relationship with Dean which was intimate and yet somehow untrustworthy become lucid anecdotes that reveal both the intricacies of Ray, but also the fragility of being. Within these asides are characters with names like Elia Kazan and Dennis Hopper who appear out of the fog repeatedly in Ray’s life. Threaded through this all is Ray’s desire to carve out a bit of individualism in a system that denies that. If there were a guiding phrase for McGilligan it would be to prove that as Ray claimed, “The celluloid strip is a bloodstream.” (139) This ceding of voice sometimes leaves dangling possibilities that go uninterrogated, such as Dennis Hopper’s claim that “James Dean directed Rebel” to which Jim Backus (the actor who plays Dean’s father in Rebel) adds: Dean was “practically a codirector” (302). Sometimes McGilligan’s prose reaches so deep into the well of clichéd muck that it incites a grown and muddies any possibility for poetry—McGilligan summarizes Rebel, as though citing a press release: “Today, Rebel Without a Cause continues to entertain, fascinate, and inspire (317). This is perhaps above all what seems most bizarre about this often-fascinating biography. McGilligan, who has a long history of writing about filmmakers, is at his best describing Ray’s life outside of film. Ushering in such a broad spectrum of research is admirable, but when quotations and claims go counter to one another, too often the author resorts to an endless line of rhetorical questions. Testimonials are given but there is nothing to parse them. Instead the author returns to re-establishing the thesis of Ray-as-true-visionary. McGilligan’s love for Ray leaves the reader in a bizarre position. From his days of studying at Frank Lloyd Wright’s Taliesin fellowship to his continued drive to produce a unique vision of alienation in Hollywood, Ray was always a complex and anomalous figure. But he has never been mainstream. For the already converted reading Nicholas Ray: The Glorious Failure of an American Director feels like talking with someone who knew Ray extremely well through mutual acquaintances, but never too personally. For the doubting, for who the name Nicholas Ray means only the director of Rebel (if that), then McGilligan’s descriptions amount to a list of encounters with fascinating people, and a charismatic man who consumed copious amounts of drugs and never seemed all that concerned with the people around him for long enough. A review of Ray’s They Live By Night, which McGilligan quotes, laments, “if only [Ray] had taken the trouble to be a Frenchman we should be licking his boots in ecstasy” (179). For the uninitiated, such a statement seems apt for this biography. The author lays out the French appreciation of Ray as an auteur, and although his mine of production facts reveal the filmmaking process as definitively a collaborative, one where Ray sometimes had little hand, the author still clings to the notion of there being “A Nicholas Ray” film. However, for any of these complaints, McGilligan’s assiduously detailed research is a long awaited and welcome addition to the English language literature, for which there remains a dearth of, on Ray. Nicholas Ray both demystifies and further pedestalizes the great director. There was no Greek fall, but there is a certain beauty to a man who, as McGilligan reminds quite often, would pause for long periods of silence in midst of conversation. These long silences, gaps unfilled where potential for insight floated like a haze, would be echoed after Ray made his last Hollywood film. To even begin to know such a tale is important to understanding a director who lived and made films during the golden age of Hollywood, yet never seemed to think in that age. While it may not be authoritative, McGilligan’s vision of Ray is seemingly something more important: authentic. Sincere thanks to It Books and Harper Collins for a review copy. 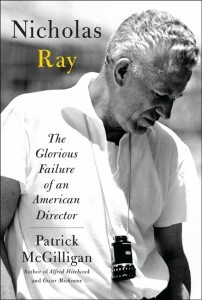 Patrick McGilligan’s Nicholas Ray: The Glorious Failure of an American Director (560 pages, with a 16-page color photo insert) will be published by It Books on July 12th.